Of the millions of bent panel lamps that were manufactured from about 1900 onward, only a relatively few survive. The replacement of a broken or cracked panel has been a problem, which seems to have eluded the ingenuity of mankind. As a result, the usual destination of a lampshade so encumbered is the nearest dumpster. The difference in value between a lampshade intact and one so defaced is immense. 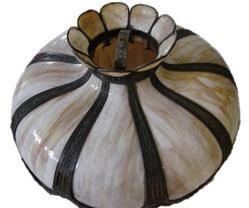 An intact bent panel lampshade is an heirloom. We have contracted with an ingenious artisan who can duplicate almost any bent panel so that the resuscitation of such impaired heirlooms need not be such an impossibility as heretofore. Contact us for further information at 1-800-262-1790. A panel bent on one plane only, $110.00 each, additional panels $80.00 each. A panel bent on two planes, $130.00 each, additional panels $90.00 each. A panel bent on two planes, with a reverse bend, $160.00 each, additional panels $120.00 each. Removal and replacing the damaged panels and other repairs are at a rate of $35.00 per hour, in 1/2 hour increments.